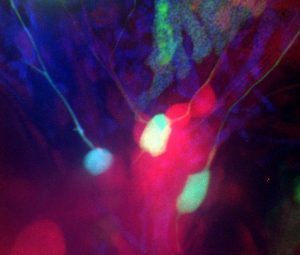 Zebrafish Trigeminal Ganglion neurons mosaically labeled with the brainbow technique. ties. Only in the last decade have the genes involved in the direct gating of sensory modalities begun to be identified. Many of these genes belong to the Transient Receptor Potential (TRP) family of non-selective cation channels, including TRPV1 and TRPA1, detectors of noxious stimuli and TRPM8, a sensor of cool temperature. While there have been recent advancements, very little is known about how somatosensory neurons become specialized during development and how their neuronal circuitry facilitates their ability to transmit specific environmental cues in the adult. We are interested in understanding the mechanism by which sensory information is coded by the peripheral nervous system, and how specific subclass specificity and neuronal circuit assembly occurs during development. In addition, we are working to identify novel sensory receptors for modalities such as mechanosensation, temperature and nociception. Discovering how the simple circuits of the peripheral nervous system assemble and code information output will not only help us understand how we perceive the world around us but may also provide valuable insight into how these processes occur in the more complex circuits of the brain. My lab is taking advantage of the recent identification of molecular markers (TRP channels) that define specific sensory modalities to help further our understanding of sensory perception. 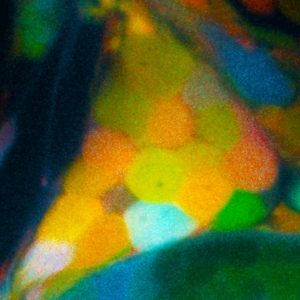 To this end, we are using novel tools and techniques that we have developed in combination with mouse genetics, molecular biology, biochemistry and live cell imaging to achieve our goals.